Years ago when I wrote my column "Widgets, Doodads and Thingamabobs" for the IPMS Journal, I was always looking at other sources for products that could be easily used in scale modeling. I would have never thought about looking in gardening supplies, until now. Organic Sales and Marketing has produced a spray for use as a surface prep for painting preparation, and as a cleaning solvent for cleaning up glue residue. Having heard its purpose, I figured you'd have to open up all of the windows before using it, but I was really surprised; it has a pleasant smell. Okay, it doesn't stink to high heaven, so it can't possibly have any modeling uses. My first thought was to try it on cleaning up paint spills and spatters on my workbench, but, it didn't work. Why, you may ask? It's not supposed to be used for paint removal, but for paint prep. So, now to test for its intended purpose. I chose some new resin aftermarket sets, some sprues from Eastern Europe, some glass and a model that I was working on. In all cases, I spritzed the object and rubbed it dry. Each one felt slick like I had just oiled them, but that was not the case. The surface was totally clean. The glass was fantastic, but this is a little pricey for cleaning glass. 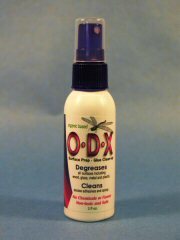 Many surface preps I have used in the past have dulled the surface, but ODX does not. Next came the glue test. The instructions say it is to be used before the glue sets, and they are right. It will not work once the glue is dry, but it works great before then. I used it to clean up epoxy, super glue, contact cement, plastic glue and a few other exotic adhesives, and it cleaned them all up with no reside left behind. I use 5 minute epoxy a lot to smooth out wing roots and stabilizer joints, where I want to fill the joint, but not lose it all together, and not have to do any sanding. I first apply it with a tooth pick and then smooth it out with a Q-Tip that I wet by mouth. There's always a very thin film left behind, but it's tolerable. Using the same Q-Tip dampened with ODX, the joint is filled very nicely and there's no film left behind. And, as I stated earlier, it didn't remove paint, so it could be used for some final touches on joints, even though they may already be painted. I always get some of it on my hands, too, and ODX takes care of that without my hands turning white and cracking. If you want to look at their advertisement for ODX, go to www.garden-guys.com. You might also get some ideas for some of those outdoor honey-dos. Thank you to Debbie Capparelli, Product Manager for Organic Sales and Marketing, Inc. for supplying the review bottle. She can be reached at 508-823-1117. Also thanks to John Noack for allowing me to review the ODX product. are the intellectual property of IPMS/USA ®.